Huawei has launched the new Honor series device HONOR 8A Pro in Russia which comes with entry-level specifications and has a single camera on the rear side. It is the global variant of the Honor Play 8A that was launched in China earlier this year. It has a fingerprint scanner on the rear side which is not available in the Chinese variant of the device. Honor 8A Pro is priced at 13,990 rubles (around $217) and comes with Black and Blue colour options. The device is for sale in Russia via the official Honor website and via the Aliexpress online store already and we can expect that the company will launch it soon in more markets. Let's now check-out the specifications of the device next. 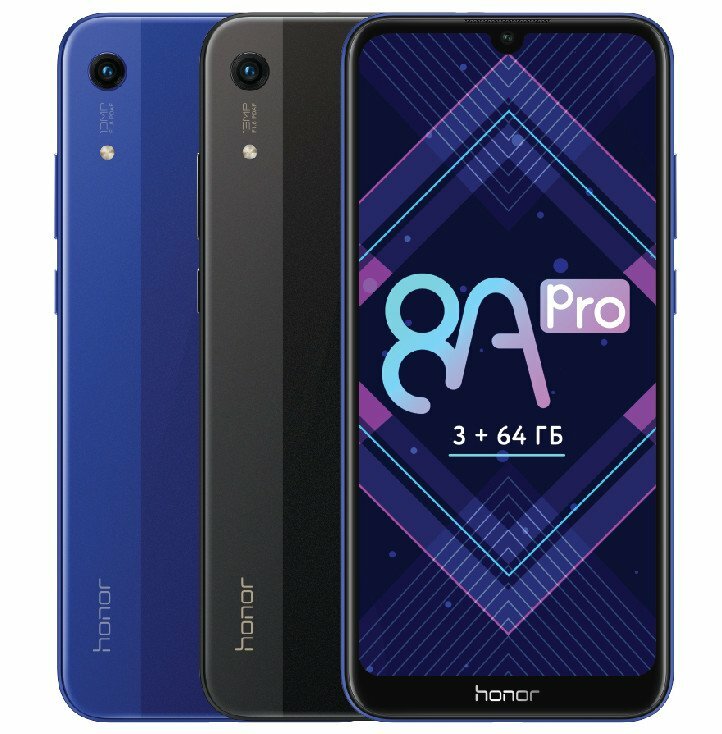 The HONOR 8A Pro features a 6-inch HD+ 19:5:9 2.5D curved glass display with 1560 × 720 pixels resolution and is powered by a 2.3GHz Octa-Core (ARM Cortex A53) MediaTek Helio P35 12nm Processor with 680 MHz IMG PowerVR GE8320 GPU. It comes with 3GB of RAM and 64GB inbuilt storage that is expandable up to 512GB with the help of a microSD card slot. It runs on the Android 9.0 (Pie) with EMUI 9.0 and supports Dual SIM (nano + nano + microSD) support. It has a single 13-megapixel rear camera with LED flash, f/1.8 aperture and also has an 8-megapixel front-facing camera with f/2.0 aperture. It has a fingerprint sensor on the rear side. It has a 3020mAh battery and comes with Dual 4G VoLTE, Wi-Fi 802.11 b/g/n, Bluetooth 4.2, GPS + GLONASS connectivity options. It measures 156.28×73.5×8.0mm and weights 150 grams. To recall, the Honor Play 8A was launched with a 6-inch HD+ 19:5:9 2.5D curved glass display with 1570 × 720 pixels resolution and is powered by a 2.3GHz Octa-Core (ARM Cortex A53) MediaTek Helio P35 12nm Processor with 680 MHz IMG PowerVR GE8320 GPU. It comes with 3GB of RAM and 64GB inbuilt storage that is expandable up to 512GB with the help of a microSD card slot. It runs on the Android 9.0 (Pie) with EMUI 9.0 and supports Dual SIM (nano + nano + microSD) support. It has a single 13-megapixel rear camera with LED flash, f/1.8 aperture and also has an 8-megapixel front-facing camera with f/2.0 aperture. It doesn't have a fingerprint sensor but comes with face unlock feature. It has a 3020mAh battery and comes with Dual 4G VoLTE, Wi-Fi 802.11 b/g/n, Bluetooth 4.2, GPS + GLONASS connectivity options. It measures 156.28×73.5×8.0mm and weights 150 grams.